I’ve been wanting to write about the subject of gymnastics rips for years: the best way to prevent them and how to care for rips after you have one. But, I’ve been avoiding the subject because I felt like all I had was anecdotal evidence (what I’ve done for rips), and the little bit of research I could find online. I felt like I needed an expert opinion on the subject of rips. This week I had the opportunity to talk with Devin Glage, the co-founder of RIPT Skin Systems. 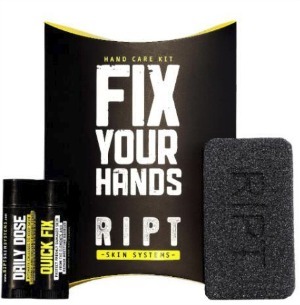 He has helped develop a hand care system designed to help you prevent rips, and heal any rips that you do get. Disclosure: I’m not a doctor and neither is Devin. You should consult a doctor for medical advice. This is a guide all about gymnastics rips. How to prevent getting rips, and what to do to help them heal once you have one. A rip is when skin gets removed from the palm of the hands or around the wrists. Sometimes a blister will form, or there will be an open wound on the hand. Rips usually occur during bar workouts, when you are repeatedly rubbing your hands against the bars. Before we can get into what causes rips, we need to discuss calluses. According to WebMD, calluses are “thickenings of the outermost layer of the skin”. They form anywhere there is a lot of friction or rubbing against the hands or feet. 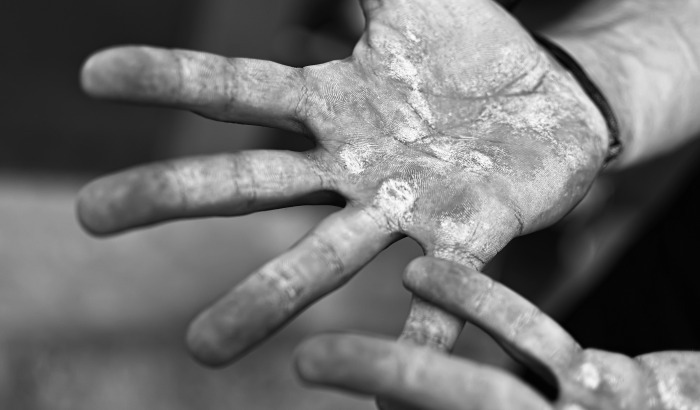 For gymnasts, calluses form on the palms of the hands because of the repeated rubbing of the hands against the bars. The friction between the bars and your hands can cause skin to break off. According to this Crossfit Journal article, your hands are more likely to rip if you either have soft hands with little or no callus build up, or you have too much callus buildup. Devin emphasized this point also, saying that as an athlete you want calluses to naturally protect your hands. He said that you want a smoothly contoured round-shaped callus that isn’t too thick so that it won’t get caught on the bars and rip. Dry skin is more likely to crack and rip than healthy skin. One of the main culprits of dry skin for gymnasts is chalk. Yes, it helps you stay on the bar, but it is also drying out your skin! So gymnasts need to be extra diligent in moisturizing their hands to counter the affects of the chalk. What is the Best Way to Prevent Rips? So now that we know what causes rips, what is the best way to prevent them? According to Devin, the key to preventing rips is in the shaping and smoothing of the calluses. You want to keep the calluses thick enough that they protect your hands, but polished and smoothed so they don’t catch on the bars. He said you also want them to be thin enough that your body (and you!) can keep them moisturized. In the RIPT Skin Systems 3 Phase Hand Care Kit, two of the phases focus on prevention: shaping and smoothing of the the calluses and moisturizing. The Grindstone is a synthetic pumice stone that you use in the shower to polish your calluses. 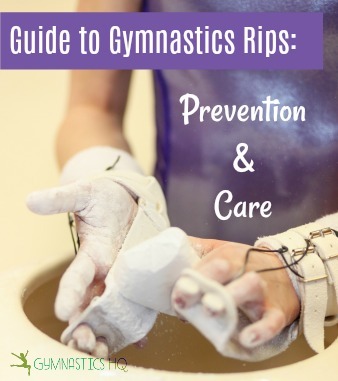 Devin says that any time you notice your gymnast’s calluses are getting white and flaky–it’s time to use the grindstone. He also mentioned that if you rub your finger on your palm and you feel a shelf that you can grab, then your calluses probably need to be thinned slightly so they don’t catch on the bars. I asked what the benefit was to using RIPT’s Grindstone as opposed to other tools like a razor or natural pumice stone. He said the synthetic pumice stone performed best under their testing, and was able to give you the smooth, round shape that you want so the calluses don’t rip. Other tools had a lack of control, and you were likely to go too deep, which would cause more harm! The Daily Dose is a moisturizing hand balm made from a beeswax and coconut base. It’s best used immediately after a bath or shower to help you keep your gymnast’s skin hydrated and pliable. Between keeping your calluses tough but smooth, and keeping them moisturized you should be less likely to rip. However, even with the best prevention methods, your gymnast is probably still going to rip every once in a while. Ok, now your gymnast has a rip. What do you do? The first thing you should do is clean the wound. If there is a big flap of excess skin, carefully cut it off. After your wound is clean, you want your rip to start healing! You can apply an antibiotic cream like Neosporin, or an all-natural solution like RIPT’s Quick Fix. Quick Fix is made using coconut oil and beeswax, ingredients with natural anti-microbial properties. Applying it helps to give your skin a natural protective layer, so that it can heal. This step is the hardest one. A new layer of skin needs to grow in order for the wound to heal. Devin says the trick to fast healing is to not let this new layer of thin skin crack or rip again. So you want to be constantly applying Quick Fix (or another skin balm), about every hour or so, so that the new skin doesn’t dry out. Ript sells their hand balms in small tubes that you can put in your pocket so that you can constantly re-apply. **ULTIMATE NINJA TRICK** Devin was kind enough to share this ultimate ninja trick to helping your rips heal fast with us. He said that since the key to healing rips fast is to not let the new layer of skin that is growing crack, on the first night after a rip try to sleep with your hand completely flat. To do this open your hand completely and tape it to a paint stirrer or ruler so that your hand stays wide open. Otherwise the new skin will form while your hand is balled up, and then when you open your hand in the morning the skin will crack. Then you’ve reset the healing process. The last step is to moisturize your new skin. You can get back to your prevention methods, and switch from the Quick Fix to the Daily Dose once you can run your hand under warm water without pain. Keep the skin moisturized, and when calluses start to build up again make sure you are smoothing and shaping them with a pumice stone ( a little goes a long way)! So in conclusion, in order to best take care of your hands you need to be diligent about a hand care routine to prevent rips. You should be taking care of your calluses and keeping them moisturized. You want to keep your calluses smooth and flexible by carefully using the grindstone in the shower. You want to keep the skin on your hand moisturized. I’m really excited about all this information that I learned from Devin about RIPT’s skin care system. I’m happy that I finally get to share with you a clear and concise method for rip prevention and care. You can obviously follow this method using other products, but if you would like to purchase the RIPT Skin System, you can head over to their website and get 10% off for the next week using the code GYMNASTICSHQ-10. This is great info, thanks! I have a post about another product that can also help rips as well!